Nick D. explains how adding combat into modern first person horror is a game-changer. Resident Evil 7 has been something of a return to form for the series. Eschewing the ever widening scope that the franchise was aiming for, the seventh instalment went back to a more singular, solitary experience. In doing so, it adopted a style of horror that the series had never really experienced before – modern first person horror. 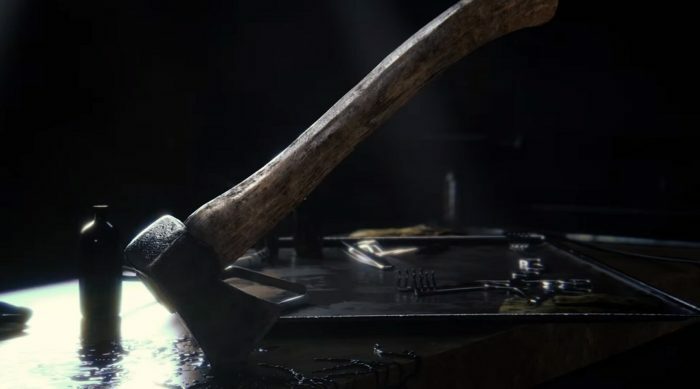 However, Resident Evil 7 was not content to simply cut and paste one of the many so-called “hide-and-seek” simulators that have hit the market in recent years. No. The game kept Resident Evil’s traditional focus on combat intact and, in doing so, showed how much more effective a first person horror game could be. The majority of modern first person horror games follow a similar trend – hide from invincible killers, while they try to find you. The major advantage of being in first person is that the game is naturally more immersive and players can’t use camera tricks to see more of the world than they are intended to. This then creates a kind of tension that had been missing in the industry when it was dominated by frequent releases of games such as Silent Hill and, of course, Resident Evil. One thing many of these titles decided to drop was combat. Perhaps the idea was that not being able to fight back against the horror that was trying to end your life made that horror much more frightening. After all, it’s hard to be scared of something that you’ve killed over and over again. In the past, unstoppable behemoths in horror games have been highly praised due to this, such as Resident Evil 3‘s Nemesis. At the same time, many first person horror games are indie games, thus the creation of a fully fleshed out combat system may simply be too expensive at times. While first person horror games such as Slender, Amnesia, and Outlast have helped to reinvigorate the slouching horror genre, they are not without their problems. One in particular is a lack of incentive to explore the game. Many of them have incredibly detailed and flat-out disturbing environments. Unfortunately, there isn’t time to really pay too much mind to them as players fly past in their attempts to avoid death. Outlast is a great example of this issue. The player is always being funnelled to an objective while desperately looking out for the killers on the loose. There’s no time to actually take in the environment around you. Really great, detailed scenes go completely unnoticed while players zoom past them. This not only causes the players to miss amazing details, but it also hurts the flow and consistency of the game. You see, there’s only so long a hide-and-seek style horror game can persist. After awhile, chases become routine, and there’s nothing else to anchor players into the game. This is a problem the game Slender: The Arrival ran into. The original Slender was a very short game about finding pages in an area, while avoiding seeing the eponymous Slenderman. Its sequel added tons of new locations and enemies, but was touted as boring for overstaying its welcome. The premise couldn’t hold that much gameplay before it stagnated. The overlying issue is that there is A. no reason to explore the environment; and B. no variety in gameplay. Interestingly enough, these two issues are interconnected. Think for a reason why players explore environments in video games. It’s usually to find some sort of item or power up that will give them an advantage as they continue playing. Sometimes it’s nothing more than a collectable, but theses instances are mostly for the OCD among us. The rest of us will quickly stop looking when it becomes obvious that there’s nothing to find. Bringing this back to Outlast or similar games, why would you explore around? The killers are invincible, so nothing you find will give you any kind of edge. Thus, you are stuck doing the same hiding from enemies that you did at the very beginning of the game. This gameplay works, but it doesn’t last. To say Resident Evil 7 borrows from these hide-and-seek games is an understatement. Invincible killers chase you for the first half of the game, and your only recourse is to hide or disable them. It’s that second point that makes all the difference. The Resident Evil series has always focused on combat. While other PlayStation horror games were dropping you into impossible fights, Resident Evil was tossing grenade launchers at you. The horror from classic Resident Evil always came more from the survival element, the need to conserve your resources or be overwhelmed by an increasingly difficult game world. Though Resident Evil 7 took much from these hide-and-seek games, it steadfastly refused to leave the player defenceless. Players were greeted to multiple weapons from different handguns to the series mainstay overpowered magnum. These weapons could be used to temporarily disable the invisible killers, thus letting the player escape. Or, critically, they can be used against the regular enemies that Capcom populated their world with. Yes, unlike most first person horror games, there are several other monsters chasing the player and these aren’t invincible. This not only lets players use their weapons regularly to let off some steam, but it helps the game itself not stagnate since there is more than just running away. Combat doesn’t just improve variety on its own, however. It has fringe benefits that are felt through the entire game. Exploration takes a huge swing up. With ammo, players must be constantly vigilant of their resources if they want to remain competitive against the game’s baddies. This means opening drawers, searching through nooks and crannies. It also allows the developer more leeway in making secrets. Non-vital rooms and pathways can be added purely to provide secret weapons or ammo stockpiles. Thus, Resident Evil 7 inadvertently created a far more complex game. Instead of the goal being to find the exit away from the creatures stalking you, the player now has many other objectives, including scouring every last inch of the environment for shells and bullets before that next monster decides to chomp on their face. This, essentially, breaks the game into three stages – the escape stage, the combat stage, and the exploration stage. All of these can be operating simultaneously or one by one to provide multiple layers for the gamer. This greatly increases the possible length of the game before it becomes boring and repetitive. And all of this is driven entirely by Resident Evil 7’s decision to include combat in their game. It would have been easy to turn the game into one long chase against multiple invincible antagonists, but Resident Evil 7 instead chose to stick closer to their roots. This removed chase fatigue and gave players more incentive to replay the game in order to find all of the secrets that Capcom hid throughout the entire game. If first person horror games want to continue to exist, they need to learn lessons from Resident Evil 7. It is very easy to bore your audience with the same old tricks, and it’s even harder to keep a game’s momentum going without some evolution to the gameplay. This has traditionally limited the length of these horror games to vignette size. However, with the addition of combat and all the benefits such a system provides, more full length major first person horror games can exist to scare the pants off gamers everywhere.